It was one of the first fully functioning cities to emerge in the ancient world and it survived for more than 4,000 years before being finally abandoned. Now a 5,000-year-old tablet found in the city of Uruk in modern-day Iraq could help to explain what helped keep it inhabitants happily living together for so long – they were paid in beer. In what is thought to be one of the oldest payslip to ever be discovered, the tablet excavated from the site of the city shows the cuneiform depiction of human head eating from a bowl, meaning ‘ration’. Beside each is a conical vessel, meaning ‘beer’ and scratches alongside each that depict the amount of beer being given to a particular person. Experts believe this is evidence that in this early civilisation to emerge in Mesopotamia there were already concepts of workers and employers. Before this human society revolved around sharing of the chores and resources that accompanied small scale farming and hunting. But it appears the move into urban living also brought about a dramatic change in the way humans worked, with people being ‘paid’ to perform tasks. Speaking to New Scientist, Dr Ian Hodder, an anthropologist at Stanford University in California, said: ‘There was a change from social sharing to hierarchies. Uruk was an ancient city of Sumer and later Baylonia during the early Bronze Age of Mesopotamia. It is thought to have shifted from a small cluster of agricultural villages to a large urban centre over a period of around 8000 years between 4,000 and 3,200 BC. As people began to live in these urban sites, it became possible for them to specialise in particular trades and purchase other services they needed. 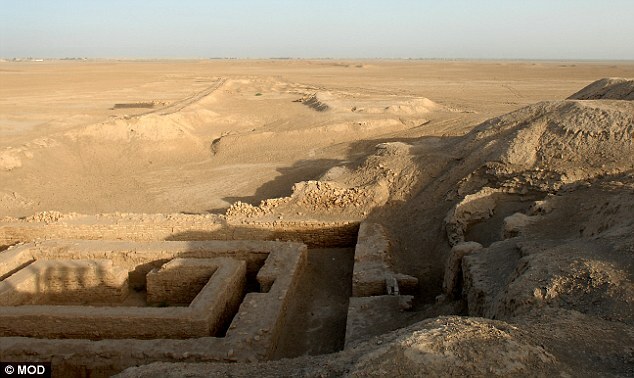 At its height Uruk is thought to have boasted more than 80,000 inhabitants. It is said to be the capital city of the heroic king depicted in the ancient poem The Epic of Gilgamesh. Beer is thought to have been a popular drink in Mesopotamia and perhaps could have helped to overcome problems with contaminated water that came with living in cities. The clay tablet depicting the payment of beer to workers is thought to date to between 3100BC and 3000BC. It is currently being kept in the collection of the British Museum in London. Clay tablets were made by engraving the symbols into the wet clay using a stylus before they were left in the sun to dry. Archaeologists have also found evidence for workers in other ancient civilisations being paid in beer. Workers building the pyramids in ancient Egypt for example received between four to five litres a day.